Institutional repositories are becoming part of mainstream scholarship in many academic libraries. Subject based repositories are well suited to disciplines such as the health sciences, where repositories are evolving rapidly. In Ireland, as in other countries, the healthcare sector produces a vast quantity of research and grey literature. This article examines how a national subject repository for Ireland's health services was established and managed by a Regional Library Service. It explores the rationale for the repository, established amid massive organizational change with a declared aim of preserving and promulgating Ireland's health literature in all its forms. Key to the success of the repository was involvement of health professionals from the outset and a continued dialogue with researchers within the healthcare system. Administrative and organizational structures in health systems around the world are undergoing rapid change and upheaval. The principle of change is supported by public opinion, as shown by a 2001 survey of five countries  Australia, Canada, New Zealand, the United Kingdom and the United States  which found that the vast majority of those surveyed agreed with the statement that "fundamental changes" to their health system were required or that the system needed to be "rebuilt completely" . Such fundamental change in organizational structures can lead to a potentially huge loss of corporate memory unless adequate knowledge systems are put in place to preserve and store this information. In Ireland, recent decades have seen similar organizational and structural changes in health care. The Health Act of 1970 established eight regional health boards across Ireland. In the Eastern region, where approximately one third of the population live (1.27 million people) the Eastern Health Board was responsible for the health and social care of its populace. In 1997 the Eastern Health Board was replaced by a new Eastern Regional Health Authority, with an additional three area health boards operating under its auspices. In 2005, all the health boards in Ireland were dissolved by law and replaced by a new national health organisation, the Health Service Executive (HSE), consisting of four new regional bodies with a national superstructure. However medical libraries attached to the health boards remained organizationally unchanged, with no national health library structure to parallel the national health organisation. The task of collecting and cataloguing corporate publications and organizational research was not centralised, remaining dependent on local initiative. It was not until 2005 that a pilot scheme (using SIRSI's Hyperion platform) was put in place to begin cataloguing the electronic publications of the Irish health service. The system was operated by the Regional Library and Information Service based in Dr. Steevens' Hospital, the administrative headquarters of the HSE. The model of institutional collaboration and pooling of resources within one repository is not unique to the healthcare sector, or indeed to Ireland. ArXiv was the pioneer in this area having been set up in 1991. Since then a total of 266 disciplinary repositories and 95 aggregating repositories have emerged in several countries. In Ireland there are currently six other national initiatives in repository development: in the areas of education, public health, social and cultural objects and digital images. In education a National Digital Learning Resources repository (NDLR) has been in place since 2010 using open source software. NDLR is funded by the Higher Education Authority in Ireland. It reports a total of 184 collections across its subject disciplines and 1,092 active contributors uploading learning resources . There is also the government-funded Digital Repository of Ireland set up in 2011, which captures social and cultural content across institutions. The National Library of Ireland operates a repository of digital photographs in place since 2010. The Institute of Public Health in Ireland operates an aggregator of websites and repositories called 'The Health Well', also in place since 2010. The National Documentation Centre on Drug Use (NDC) focuses on Irish drug, alcohol and tobacco-related research. Finally, RIAN is the aggregator of seven university research repositories in Ireland; it too was launched in 2010. The benefits of gathering an organization's research in a single repository were already well understood , while a subject-based health repository would also help to solve the problem of ensuring long-term preservation of the output (such as position papers, statistical reports and technical specifications) of the other Irish health organizations for which no preservation plan existed. Studies have also shown that researchers prefer subject-based repositories [10, 11]. A project sponsor, team and manager were put in place. The project team was made up mainly of library staff but included a representative from the Public Health and ICT directorates in the HSE. Public health services are among the largest producers of publications in the health services globally, with an average of 20,000 research papers published per year . The project team therefore felt it essential to have a public health representative involved from the start. Consultation with the Communications directorate of the HSE was also carried out periodically during the project. Attend a demonstration of three repository systems and participate in an evaluation of the demonstration under a range of headings, for a period of 1.5 hours. The initial focus group was held in June 2008 and was reconvened in October 2009 after the launch of the repository. This allowed a steady flow of feedback from repository users and secured buy-in through ongoing participation and involvement in the project. The follow-up focus group was broadened to include an external agency (the Health Research Board) which funds health research in Ireland. In parallel with the focus group, two surveys were circulated. One was to a targeted group of users (n=22) who had expressed interest in participating in the evaluation stage. An overwhelming majority of the group expressed an interest in submitting their research to a repository, if one were to be established (see Table 1). The second survey was sent to all library staff (n=54) (professional and non-professional) in the HSE, with a 25.5% response rate. The surveys yielded important insights about repository hierarchy, structure, subject headings, content and collection development, which were used later in the project to inform policy direction. In particular the significant aggregated usage of HSE online resources provided a strong rationale for a HSE-based repository (see Table 2). Once user involvement was in place, a tender was drawn up and quotes were sought from three short-listed vendors. The project team conducted extensive analysis on existing repository systems, with all team members actively involved in the selection process. This was deemed important as participation from the beginning ensured that staff members  professional and non-professional  felt a sense of ownership of the project. The contract was awarded to BioMed Central, an open access publisher for a hosted Open Repository system. Key to the success of the new repository was the smooth migration of content from the pilot archive to the new system; this was successfully completed by the end of 2008. Branding is an important element of marketing and the new repository needed a distinctive brand name. The name that was chosen was Lenus  an ancient Celtic god of healing and well-being. This choice crystallized the two key facets of the repository  health related content and a characteristically Irish dimension. Lenus uses BioMed Central's Open Repository platform, based on DSpace open-source software. The content capture started with official publications and research output of the HSE but soon grew to incorporate the research output of hospitals, health care professionals working in the community and Irish health organisations. Content is captured by the use of a distributed model of contributors, which requires that the submission process be clear and simple. To submit an item, the repository must first be checked to see if the item is already present. If the item has a PMID or DOI, the repository will notify the submitter if a duplicate is present. If not the item may be deposited  this triggers an email to the repository's Review Group to assess the submission for quality assurance purposes (such as compliance with repository metadata standards and AACR2). The reviewer either accepts or rejects the item and the submitter is informed by an automatic email response. If accepted, the item 'goes live' and becomes part of the repository. Lenus has been indexed in the WorldWideScience Alliance and harvested by Researchscope since 2010. As mentioned earlier it is part of the 'Health Well' and plans are also underway for its integration into RIAN. RIAN will in turn be indexed in the European Union's OpenAIRE infrastructure. Technical architecture, metadata standards, copyright and interoperability issues have been identified as critical to the development, management and sustainability of digital repositories . In addition, authority control and controlled vocabularies are central to discoverability and interoperability , and Lenus conforms to a number of technical standards which help to maximise these. The DSpace-based Open Repository platform is OAI-PMH and DC-compliant, and for manually-deposited items Lenus uses the Public Health Language (PHL) subject thesaurus as a controlled subject vocabulary, in accordance with Dublin Core recommendations for best practice . Use of PHL does not preclude the additional use of uncontrolled subject headings but it is a required minimum. Published articles and pre-prints batch-imported using the SWORD protocol are pre-populated with MeSH headings. At present there is no name authority control; this is still not well managed by repositories generally and is widely reported as a general failing [18, 19]. Since its launch in 2009, the number of visits to the repository has grown by 545.06% (see Figure 1). 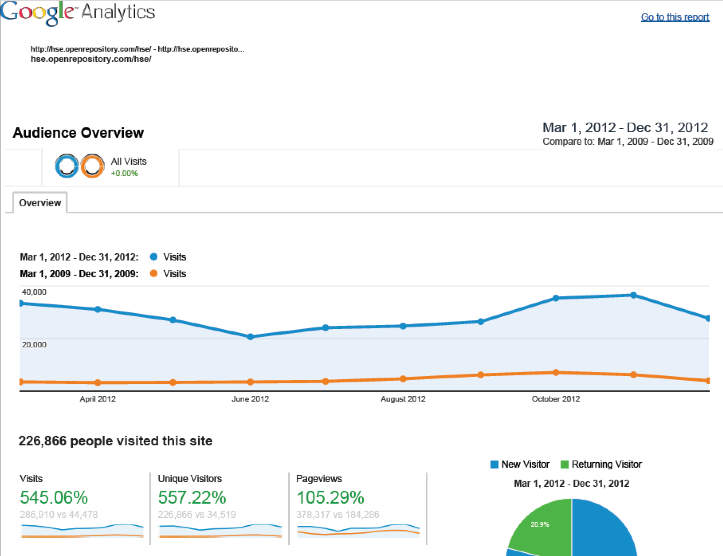 Figure 1 shows an audience overview using Google Analytics. It shows a comparison of visits to Lenus between March and December 2009 and those between March and December three years later in 2012. Average monthly visits in 2009 were 4,500 whereas during 2012 they were 28,600 showing a significant rise. Average monthly visits during 2013 were 82,115  a steady increase since 2009. According to the Ranking Web of Repositories, Lenus ranks 349 out of 1,650 repositories worldwide. In addition to the healthy traffic evidenced by activity statistics, agreements are in place with several Irish publishers in the health sciences to make their journals' full-text articles openly available in Lenus. Discoverability of resources within Lenus has proven successful as the figures above show. However, collaboration with and amongst researchers has been less successful. There is no research support system available in the HSE to integrate with the repository, and this has proven a significant barrier to the systematic harvesting of research within the HSE. Low rates of self-archiving have been a problem for repositories generally  a commonly encountered issue for which a widely-supported (albeit partial) solution is some form of institutional submission mandate (14, 20, 21, 22). Lenus' content has grown from the 4,226 items migrated from Hyperion in 2008 to 17,481 item records recorded in September 2013. A significant proportion of the repository contains digitized content which was not previously available online. SPARC outlines the essential elements of a digital repository, namely that it be "institutionally defined"; "scholarly"; "cumulative and perpetual"; and that it permit "interoperability and Open Access" . In addition proper strategic planning is an important element in the growth and development of repositories generally, as Clifford Lynch has argued . The management of Lenus incorporates each of these elements. Lenus is a national repository  that is, it combines the role of a subject-based repository (health in Ireland) with that of a single-institution repository of nationwide reach. 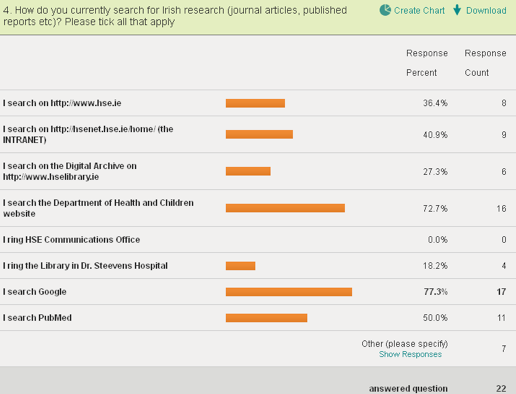 With content harvested from over 130 health agencies, it is a rich source of grey literature on healthcare in Ireland. The overall content is therefore defined by a large number of organizations, a number of whom participate in a Lenus Working Group. This group was established in 2011 and arose out of the strategic plan for Lenus agreed a year earlier. It meets twice a year to discuss policies, procedures, workflows and future direction. The group helps to democratise the repository and provide it with good governance. Meanwhile the strategic plan has been revised and brought under the remit of an Open Access Research Advisory Group within the HSE, formed in 2013. This group brings together key stakeholders in the Irish health services and will in time be expanded to include service user representatives and other parties. Risks to the project identified in the strategic plan included threats to sustainability and funding. With this in mind, a number of initiatives were undertaken to place Lenus at the heart of research in the HSE. In 2009 Ireland's Department of Health published an 'Action Plan for Health Research' . In response to this, a clinical champion was identified within the HSE who issued a call for research to all hospitals in the Republic of Ireland (the use of a champion has been identified as a core advocacy function in institutional repositories) [20, 25]. The research call has become an annual request; calls of this kind have been shown to greatly improve the rate of research deposit by clinicians into repositories . Members of the Lenus project team have begun participating in a national Open Access steering group which issued a 'National Principles Statement on Open Access (OA) Publishing"  in 2011. This led the HSE to produce its own institutional position statement on OA in 2013 . These developments have boosted the repository and raised the awareness and profile of Lenus at a strategic level, cementing its role in research capture and dissemination within the organization and helping to ensure its long-tern sustainability. Dialogue with researchers is maintained in a number of ways. As previously mentioned, an annual call for research is issued to all hospitals and ethics committees in Ireland. This in turn is circulated to researchers in hospitals. Additionally, since 2010 the Regional Library has organised events during International Open Access Week which are advertised on the Open Access Week website. At each event, researchers in the health system contribute as presenters, panellists or facilitators. A presentation on Lenus is a regular feature. Presentations are archived in the repository. This serves to keep the research community abreast of developments and to give them an opportunity for feedback. Thirdly, the Public Health department of the HSE has offices located in different counties in Ireland, which gives it almost unparalleled reach among Irish healthcare bodies. A major dividend for getting the Public Health directorate involved from the start of the project is that they now directly populate the Public Health community in the repository with their own publications and research. This type of organizational buy-in is seen as a template for future development. Finally a survey of users' experiences and expectations of Lenus was carried out in 2012 (n=450), and proved extremely useful in informing the project team's development plans. It is planned to repeat the survey every two to three years. While Lenus has enjoyed reasonable success since its launch in 2009, a number of difficulties have been encountered at the technical, organizational and operational levels. As noted already [18, 19], the lack of name authority control is a barrier to research discoverability within the repository, as authors may be indexed under multiple variants of their names. The repository's user interface is ageing and inflexible. Organizationally the absence of a central research support system within the HSE has hindered research capture, particularly in the community setting, which obliges the Lenus project team to harvest research directly from individual clinical institutions. And at the operational level, the repository has no dedicated staff complement; all Lenus staff are HSE library service employees carrying out their repository duties in addition to their regular tasks. The still-low (though improving) levels of self-deposit by researchers and contributing bodies mean that Regional Library staff carry out the bulk of item deposits, adding an extra workload to an already hard-pressed team. Subject repositories in the sciences including arXiv and PubMed Central are reported to have 'come of age' . However, national efforts to build repositories in Ireland are still in their infancy (although the national position statement on open access in Ireland has done much to raise their profile). Lenus' successes to date stem from a clear vision, project management, buy-in from outside organizations and careful positioning as a repository for grey literature and research in the Irish health services. The output of the repository is in line with the National Standards for Safer Better Healthcare  which specify the use of "quality information" as a standard for health services in Ireland. And the recent establishment of governance groups in the area of Open Access at strategic level both within the HSE and external to the organization have been key to establishing Lenus as the leading repository for the Irish health services. Improved collaboration with publishers and the national move to a green model of Open Access in Ireland  as mandated by both the Irish government  and the HSE   should strengthen the repository into the future. National Digital Learning Resources. NDLR Key Achievements Summary 2009-2012. Dobbins, Maureen; Robeson, Paula. A Methodology for Searching the Grey Literature for Effectiveness Evidence Syntheses related to Public Health. Available from healthevidenc.org. UK Health Forum. Discussion Paper: grey literature in public health: valuable evidence?. Higgins, Julian PT (ed.) Cochrane handbook for systematic reviews of interventions. Vol. 5. Chichester: Wiley-Blackwell, 2008. (Section 13.3.1.1 Comprehensiveness of search strategy). Crow, Raym. "The case for institutional repositories: a SPARC position paper." ARL Bimonthly Report 223 (2002). Heery, R, Anderson, S. Digital repositories review. Johnson, T. Using SKOS and FOAF for name authority in the institutional repository. Paper presented at Open Repositories 2013. Charlottetown, PEI, Canada. [Internet]. Confederation of Open Access Repositories (COAR). Incentives, integration and mediation: sustainable practices for populating repositories. [Internet] COAR, (2013). Harnad, S. Maximizing research impact through institutional and national open-access self-archiving mandates. (In Press) Invited Keynote. CRIS2006. Open 2 Access Institutional Repositories. Current Research Information Systems. Bergen, Norway, 11-13 May (2006). Lynch, Clifford A. Institutional repositories: Essential infrastructure for scholarship in the digital age. ARL (2003); no. 226, 1-7. Department of Health. Action plan for health research 2009-13. Dublin. Stationery Office, (2009). UK Open Access Implementation Group. Advocacy [Internet]. National principles for Open Access policy statement Ireland. [Internet]. Health Service Executive's Open Access publishing statement. [Internet]. Health Information and Quality Authority (HIQA). National Standards for Safer Better Healthcare. (2012). [Internet]. Aoife Lawton is Systems Librarian at the Regional Library & Information Service, Health Service Executive in Dublin, Ireland. She is project manager of Lenus the Irish Health Repository. Her research interests include repository management, open access, library spaces, evidence based library & information practice and emerging technologies. Aoife is a founding member of Repository Network Ireland and holds a MLIS from University College Dublin and an Honours Degree in European Studies from Trinity College Dublin. Padraig Manning is a librarian in the HSE's Regional Library & Information Service based in Dr Steevens Hospital, Dublin, Ireland. He is a founder member of the Lenus Project Team. His research interests include metadata, repository structures and mental health information resources. He holds a Master's degree in Arts and a postgraduate diploma in Library & Information Studies, both from University College Dublin.